The forex day trading system shown below is Ty Young's strategy that he used to win one of the biggest trading competitions in the world. It's interesting to note that this system uses about a handful of indicators to enter a position. Some people say that indicators don't work as they are lagging behind in time - but Ty proves that using indicators does work. Bollinger band ; 20 and standard deviation of 2. CCI ; 50 with + & - 100, 200, 300. We will consider a position for a long entry. So reverse the rules below for short positions. The system works on ANY time-frame. Select one that suits your trading personality. ie Short term if you like to scalp the markets and long term if you only want limited participation. Watch for ALL the triggers to trigger before placing a position. If you are an aggressive trader you can enter the position soon after the trend line break. Otherwise wait until where entry is shown on the chart below. 1.MACD histogram shows divergence to price action. Notice how price is moving downwards yet the MACD histogram signals divergence. (See how line below is drawn between MACD histogram peaks forming a upward slopping line). 2.MACD has changed from negative to positive. 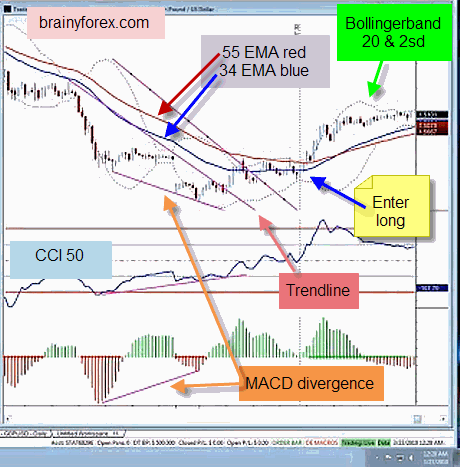 (MACD is green and above center line). 3.CCI rises above +100 and stays there. 4.Price breaks above downward trendline. 5. Bollinger bands are now moving upwards instead of downwards. 6.Price touches or comes close to lower bollinger band. 7.The moving averages start coming closer to one another. Note that they don't have to cross. 8.Notice rising lower bottoms for price. 9.Enter long position where shown on chart. It should also be noted that Ty also trades this system using 55, 13 & 8 EMA's. To explore more free trading systems go here.